Working in a restaurant is tough. You're standing in front of hot things, holding sharp things, for hours on end with little pay. But, oh, the seltzer. The one respite from never-ending back pain is a bubbly, bottomless supply of it. Whenever I'm cooking at home over a steamy pot, I daydream about the day I'll have a soda gun installed in my kitchen to spray seltzer directly into my mouth. Until that time comes, I'll just have to settle for the next best thing—countertop and handheld soda machines. We put the top brands to the test to find the ones that are the easiest to use and carbonate the best. The SodaStream Source is the industry standard in soda makers for good reason. It not only consistently made the bubbliest soda of all the units we tested, but was also the easiest to use. The bottle on this model quickly snaps into place, with no twisting required, and injects CO2 into the water with just the press of a button. It also has clear LED indicators displaying three levels of carbonation. With its uniquely designed pressure release valve, the Drinkmate is the only soda maker on the market capable of safely carbonating any pulp-free liquid, from fruit juices to wines and cocktails. Its minimalist design is similar to that of the SodaStream Source: CO2 is injected into the liquid with just the press of a button, and the bottle easily slips into place, with no twisting required. If you're short on space, or just prefer seltzer by the splash rather than by the glass, this compact soda maker fits snugly into any refrigerator door. The iSi Sodamaker Classic can carbonate 0.9 liter of water at a time using recyclable, 15-gram CO2 cartridges. This unit also maintained the carbonation level of the water over the long term better than the other models tested. Seltzer is just plain old water with carbon dioxide dissolved into it. The carbon dioxide not only makes the water pleasantly bubbly, but also lowers the pH of the water ever so slightly, resulting in a tongue-stimulating, mild burn. There are many bubbly waters on the market, and they are not all created equal. Much like seltzer, club soda has carbon dioxide dissolved into it, but it also contains trace amounts of added minerals, such as sodium citrate and potassium carbonate for flavor. On the other hand, sparkling mineral water is naturally carbonated with naturally occurring minerals. The bubbles in sparkling mineral water are therefore much finer than those in seltzer or club soda. A soda maker can be a great tool for enjoying seltzer at home, cheaper and more convenient than buying the canned or bottled stuff. However, even our top picks produced seltzer that was slightly less effervescent than the fizz you get from popping open a can. If you want to make the bubbliest of seltzer at home, your best bet is to set up an at-home carbonation rig following our instructions. But a good commercial soda maker will get the job done admirably. There are two styles of seltzer makers available: countertop models and handheld models. Countertop models come with bottles that you fill with tap (or filtered or bottled) water, then screw or snap into a unit. Inside that unit is a large, refillable CO2 cylinder that also screws into it. A 14.5-ounce cylinder costs about $35 for the initial purchase and $10 to refill. (SodaStream has a convenient map to help you find a refiller near you.) The makers of the cylinders claim that each one has the capacity to carbonate 60 liters of water, but the amount of CO2 used depends heavily on the user's carbonation-level preference, which greatly changes the yield of each cylinder. A handheld model has a canister that you fill up with water before screwing on a siphon head. Next, a CO2 cartridge is inserted into a cartridge holder, then screwed onto that siphon head. Once attached to the siphon head, the cartridge is pierced, injecting the carbon dioxide into the water. After you've given it a few vigorous shakes to distribute the CO2 throughout the water, the seltzer is ready. All models recommend using chilled water, since CO2 dissolves into it more readily than room-temperature water. 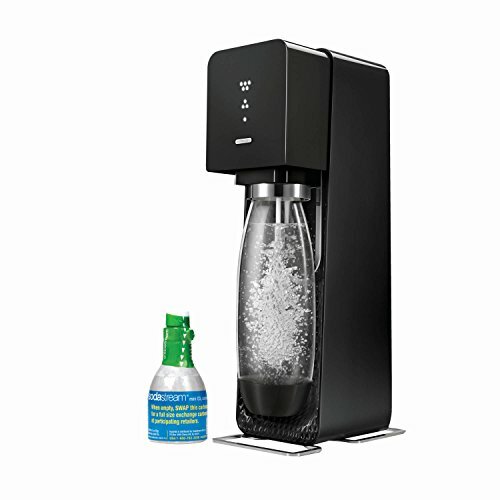 We were looking for a soda maker that was easy to use and consistently made the bubbliest seltzer. To us, good seltzer has an abundance of big bubbles—perfect for cocktails, tempura batter, making homemade soda, or just sipping on its own. We started by measuring the amount of carbon dioxide each model added to water in grams. Each unit was filled with 800 grams of water and chilled to 34°F (1°C). The maximum volume of each unit varied from 0.8 liter to 1 liter, so we went with the lower limit to keep the tests consistent. For the countertop models, we injected the CO2 into the bottles using 10 quick, quarter-second bursts, either by pushing a button or by pulling a lever, depending on the model. For the handheld models, we charged them with two 15-gram CO2 cartridges, either made by the manufacturer or recommended by them. This is more carbon dioxide than necessary, but we wanted to ensure that we were injecting a measurable amount of CO2 by making soda with maximum bubbles. We weighed the water before and after injecting it with carbon dioxide to find the percentage change in weight. This indicated to us which models maintained pressure better, allowing the water to absorb more carbon dioxide. The SodaStream and the iSi Classic had the most carbon dioxide, showing a change in weight of just over 0.7%. We also weighed the water after it had spent a day in the refrigerator to see which models held the most carbon dioxide overnight. Here, the iSi performed the best, showing almost no loss in carbon dioxide. The seltzer from the worst-performing unit increased in mass by only 0.1% just after injecting, and was completely flat after a day. Once again, we filled each model with 800 grams of water, chilled to 34°F, before injecting it with carbon dioxide in the same manner as in the previous test. We blind-taste-tested the resulting seltzer, scoring each on bubble size, quantity of bubbles, and overall "fizziness" using a scale of one to 10. The tasters' scores correlated with the results from the previous test, illustrating that water perceived as bubblier also contained higher levels of carbon dioxide. The tasters unanimously picked the seltzer made by SodaStream as their favorite. An egg cream is a classic soda fountain drink with Brooklyn roots. It's made by stirring seltzer into milk and chocolate syrup (traditionally, that syrup is Fox's U-Bet). The perfect egg cream is a light and effervescent chocolate milk topped with a foamy head. This is possible only with the best and bubbliest of soda, because the dilution of the seltzer, combined with vigorous stirring, reduces the strength of the bubbles even before the first sip. For each egg cream, we started with two ounces of milk in a glass. We stirred the milk with a bar spoon while pouring in the seltzer made by each soda machine, before finishing with one ounce of chocolate syrup, stirred from the bottom to maintain an unmarred white head. We then judged each egg cream on the quality of the head and the overall fizziness of the drink. Some of the sodas made flat egg creams with barely any froth, while all the winners' sodas yielded a creamy, rich foam. The winning soda machines had the highest level of carbonation by weight, were perceived by the tasters to have the most fizz and bubbles, and made the frothiest, richest egg creams. The SodaStream Source made the tasters' favorite seltzer and egg cream soda, and it had the highest level of dissolved carbon dioxide, tied with the iSi Classic, after 10 pulses. It's the brand that first made homemade soda popular and is still the industry leader for at-home water carbonators. The SodaStream is also the easiest of the bunch to use, with a bottle that quickly snaps into place and a back cover that is simple to remove for replacing the CO2 cylinder. The LED indicator in the front displays the level of carbonation, for consistently bubbly seltzer. The SodaStream can only carbonate water, but syrups can be added to the water afterward if you want to make flavored soda at home. SodaStream sells its own line of syrups, with flavors from cola to lemon-lime, in both sugar-free and regular versions. The machine comes equipped with a three-ounce cylinder of carbon dioxide to get you started (enough to carbonate nine liters of water) and includes a rebate for a 14.5-ounce cylinder (good for about 60 liters of water). The initial cost of a 14.5-ounce cylinder is about $35, but the $15 mail-in rebate brings the cost per liter down to roughly $0.33. The cost of refilling the cylinder is only $10, which means that the per-liter cost eventually goes down to $0.17. SodaStream also offers a premium version of this model, the SodaStream Power, which must be connected to a power source and carbonates to your desired level at just the touch of a button, instead of requiring multiple pulses. We ultimately felt it wasn't worth the additional expense for the extra feature (plus the hassle involved in having to keep it near an outlet), but it is a good choice if you want to feel extra fancy. If you're only interested in carbonating water, the SodaStream seems like the best bet, considering the company's longevity and the widespread availability of replacement parts. But if you want to experiment with carbonating a variety of liquids, the Drinkmate is the way to go. It's the only brand of soda maker that can carbonate any pulp-free liquid, opening up a world of carbonation possibilities. It has a two-stage pressure release valve that allows you to keep the beverage from foaming excessively and spilling out of the bottle. This valve is key to the ability to carbonate any liquid. The other models have small, automatic pressure release valves, which easily become clogged if any liquid other than water is carbonated. The Drinkmate's larger, manual pressure release valve allows you to safely control the entire carbonation process, and it's detachable, so you can thoroughly clean any trapped sugar or gunk. The Drinkmate came in just behind the SodaStream in our testing of carbonation, with an increase in weight of 0.4% after we injected the water with carbon dioxide. The tasters ranked the Drinkmate's seltzer and egg cream just behind the SodaStream's and the iSi's. It's worth pointing out, though, that we made the egg creams using the traditional method of stirring the seltzer into the milk and chocolate syrup. The Drinkmate can overcome its shortfall here because it can carbonate the milk, water, and chocolate syrup together, removing dilution and stirring from the equation and ultimately making the fizziest egg cream. The Drinkmate's bottle is the only one that can be opened from the top and bottom, for easy cleaning and drying. The bottle is very easy to attach to the unit, quickly sliding in without needing to be screwed in. It also has a 0.8-liter capacity and carbonates with the same standard three-ounce and 14.5-ounce refillable carbon dioxide cylinders as the SodaStream—which means you can refill your CO2 tanks at any SodaStream-approved refilling location. 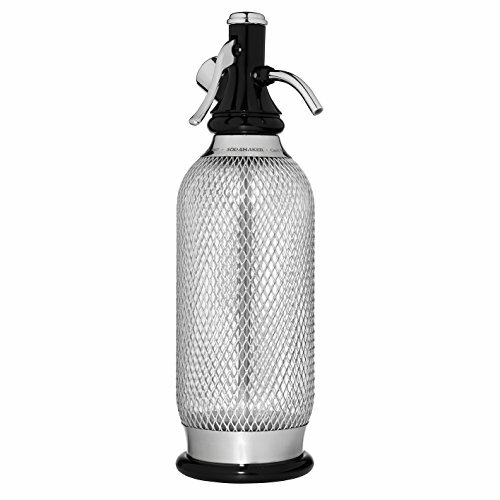 The iSi Sodamaker Classic is an update from the brand's original model, the iSi Soda Siphon. Not only does the vintage design make you feel like Don Draper, but the seltzer-dispensing trigger is also much more responsive and easy to control, minimizing messes and spills. This lightweight model has a fraction of the footprint of the countertop models and fits easily into a cabinet or large drawer, so it's perfect for small living spaces. The canister maintains constant pressure in between pours, so the first sip is as bubbly as the last. Bottles that must be uncapped for every drink depressurize immediately, leading to increasingly flat seltzer, but the iSi Classic pours by opening a small valve, which pulls seltzer up through a tube, so the canister's internal pressure is maintained as seltzer is dispensed. This makes it the ideal addition to a home bar, where you may need just a short spritz in your Scotch or cocktail. The manufacturer recommends a quick shake before every pour to get the most bubbles. It has a maximum capacity of 0.9 liter and uses one CO2 cartridge to carbonate. We tested the seltzer with two cartridges to get more bubbles, but one is sufficient to fully carbonate the water. It works with any brand of CO2 cartridge, although the manufacturer recommends sticking with iSi-branded cartridges, which are recyclable but not refillable. The cost per liter of seltzer is $0.59 if you purchase a 10-pack of cartridges, but decreases to $0.43 if you purchase a 120-pack. This is still significantly more expensive than the cost of refilling 14.5-ounce cylinders and is therefore not ideal for serious seltzer guzzlers. The AARKE Premium Carbonator had the best design of the bunch; it looks suitable for a professional bar or coffee shop. However, the soda it made was the least bubbly of all the models tested, and it became completely flat after only a few hours. The screw-on bottle was also awkward to install and frequently overflowed and leaked. The SodaStream Power Sparkling Water Maker performed as well as our top pick, the SodaStream Source. The only difference between the two models is that this unit features automatic carbonation at the touch of a button, instead of requiring manual pulsing to inject the carbon dioxide. As mentioned above, although this was a nice feature that allowed for consistent carbonation at a variety of levels, we didn't feel that it justified the higher price tag, and we found the need for a power source cumbersome. The iSi Stainless Steel Soda Siphon carbonated water as well as our top handheld pick, the iSi Classic. However, the seltzer-dispensing trigger on this model was difficult to control, often spraying soda at very high pressure and splashing it out of the glass. The handheld Soda Sparkle Sparkling Water Soda Machine works only with extra-long, proprietary carbon dioxide cartridges. These cartridges are almost a dollar each, making them three times the price of any other cartridges available on the market.